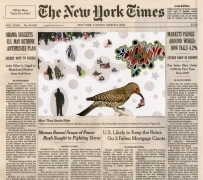 FRED TOMASELLI Aug. 1, 2013, 2013 Collage, gouache, marker, and archival inkjet print on watercolor paper 10 3/4 x 12 in. 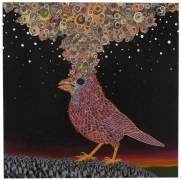 James Cohan Gallery is pleased to announce an exhibition of new work by Brooklyn-based artist Fred Tomaselli. 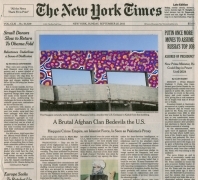 Current Events opens on May 1 and runs through June 14. 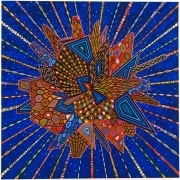 This is the artist’s fourth solo exhibition at the gallery. 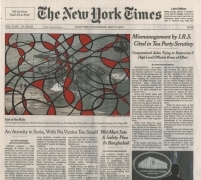 Tomaselli will present 8 new paintings and over 30 works from his ongoing New York Times collage series. 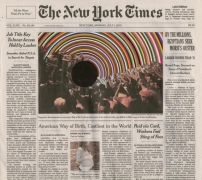 On the occasion of Current Events a new publication, Fred Tomaselli: The Times, is to be released by Prestel. 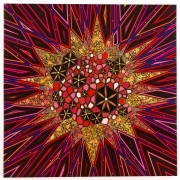 The series also will be the subject of a touring exhibition to open at the University of Michigan Art Museum in October 2014 and will travel to the Orange County Museum of Art in February 2015. 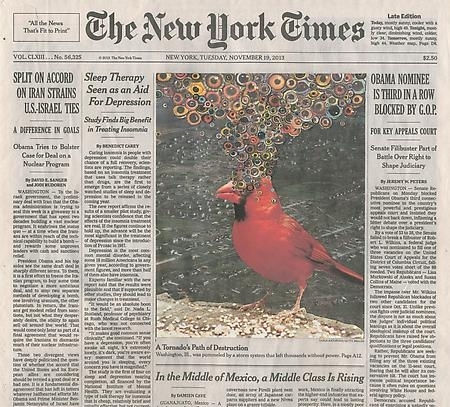 For Fred Tomaselli, art has psychotropic properties; it creates a pathway to altering and rearranging our perceptions of reality. 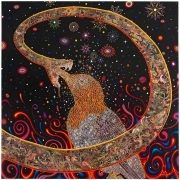 Over the course of a career that spans three decades, Tomaselli has transformed his daily life and many obsessions—gardening, birding, fly-fishing, recreational drugs into mind-bending, consciousness-expanding paintings. 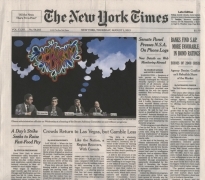 On Wednesday, March 16th, 2005 a new element from his everyday entered Tomaselli’s practice—The New York Times. 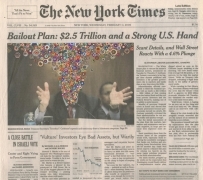 He became absorbed by the photo on the front page in which he describes, “Bernie Ebbers, the just convicted WorldCom chairman, was clutching the hand of his wife as he was being expelled from ‘the Eden of Finance’ by the camera-wielding angels of the paparazzi.” Drawing and collaging directly on the photo, Tomaselli created his first “collaboration” with the lead page of The New York Times. The series now consists of 80+ works. 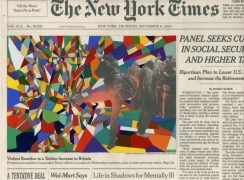 Several of the new large scale paintings in Current Events are in direct conversation with the more intimate collages. 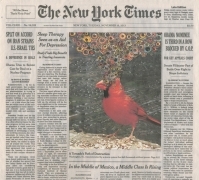 In works like After November 19, 2013 (2014) the top of a male cardinal’s head becomes a tornado cloud of magazine cut-out and painted eyes while the bird stands in a denuded waste-land. 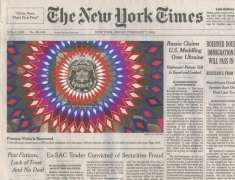 The dazzling geometric patterns in After November 11, 2010 (2014) emerge from the destruction brought on by protesters raging against tuition increases in Britain. 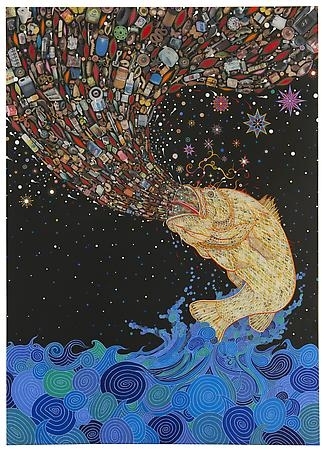 In other paintings like Gyre (2014) a fish leaping from the frothing sea inhaling plastic household objects is a reference to the vast trash vortex in the North Pacific. In Penetrators (2012), a snake whose body is made of a proliferation of field-guide reptiles and a bird whose feathers are colonized by seed catalogue flowers fight out the perpetual psycho-sexual Darwinian battle for dominance. 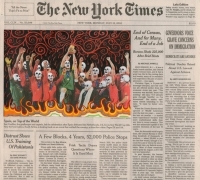 As a collagist, Tomaselli is enthralled by the notion of the collective. Harvesting the lead photo is his art-making corollary to the way the “hive” of individual image makers—the photographers and editors—present a subjective take on the reality of each day. 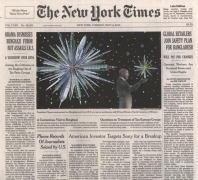 Where there has always been an engagement with the sociological in his work, Current Events provides a platform for Tomaselli to inject new “tendrils of the apocalyptic and pathological” into what he sees as the profuse, ornate and beautiful shape of nature. 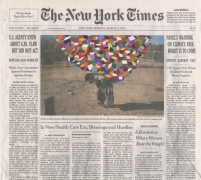 Fred Tomaselli (born 1956, Santa Monica, CA) has been included in international biennial exhibitions including Sydney (2010); Prospect 1 (2008); Site Santa Fe (2004); Whitney (2004) and others. 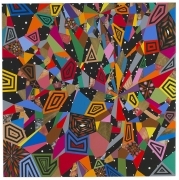 Solo exhibitions include the Modern Art Museum of Fort Worth (2014); a survey exhibition at Aspen Art Museum (2009) that toured to Tang and Brooklyn Museums (2010); The Fruitmarket Gallery, Edinburgh (2004) toured to four venues in Europe and the US; Albright-Knox Gallery of Art (2003); Site Santa Fe (2001); Palm Beach ICA (2001), and Whitney Museum of American Art (1999). 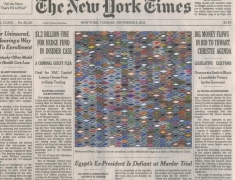 Tomaselli’s work can be found in the public collections of institutions such as the Museum of Modern Art, NY; Whitney Museum of American Art; the Brooklyn Museum; Albright Knox Gallery; and the Museum of Contemporary Art, LA. 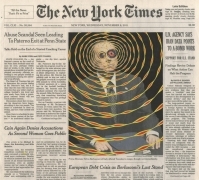 To order a copy of Fred Tomaselli: The Times, please contact Cassandra Robinson at crobinson@jamescohan.com. 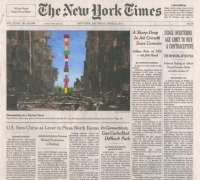 Press contact is Jane Cohan at jane@jamescohan.com or by phone 212-714-9500.